Fibromyalgia syndrome (FMS) is a widespread musculoskeletal pain and fatigue disorder for which the cause is still unknown. Ongoing investigations continue as medical and manual therapy offices are flooded with increasing numbers of reported fibromyalgia cases but, like the oft-quoted analogy of the blind man and the elephant, we currently know more about the components of FMS than we know about the “beast” as a whole. Now that rheumatologists have granted legitimacy by labeling and classifying this vague and controversial syndrome current beliefs regarding possible origins must be discussed. Fibromyalgia primarily manifests as pain in muscles, ligaments and tendons — the fibrous tissues in the body. FMS was originally termed fibrositis, implying the presence of muscle inflammation, but contemporary research proved that inflammation did not exist. Some in the complementary medical community believe that fibromyalgia should be a primary consideration in any client/patient presenting with musculoskeletal pain that is unrelated to a clearly defined anatomic lesion. Conversely, many researchers question the very existence of the syndrome since fibromyalgia sufferers typically test normal on laboratory and radiologic exams. For more than a century, medical science has continued to move forward in its ability to recognize, categorize, and name painful patient disorders. Technological advances have made it much easier for medical doctors to rule out specific maladies from a variety of symptoms presented in the clinical setting. Additionally, modern testing methods have allowed researchers to become more confident in their ability to determine what is and what is not a disorder or disease. However, this newfound confidence has created controversy and debate over some disorders, which cannot be universally proven, even though the symptoms are undeniable. In recent years, many common diseases have been named and treatments discovered. This applies to mental health as well as physiological disorders. Today’s society seems to be more open now than ever before to the possibility that there exists mental and physical dysfunctions not yet recognizable through medical testing, but real just the same. Part of this acceptance comes from mankind’s history of disease discoveries. It was not so long ago that people with epilepsy were believed to be possessed by the devil. Today, it is an accepted disorder with known biological causes and medical treatment options. The historical fact that symptoms, dysfunctions, and diseases often appear long before researchers are able to devise reliable diagnostic testing procedures to identify and treat the malady makes it appear unreasonable that the existence of the condition would be doubted or debated … but this is the case with fibromyalgia. Simply put, one camp believes that FMS is a mental health issue without a biological origin. Whereas, the other camp is firmly convinced that it is a physiological disorder even though researchers have yet to identify definitive diagnostic criteria. While each side squabbles over the fibromyalgia conundrum, thousands of Americans each year suffer diverse and sometimes disabling symptoms with little help coming from the medical and insurance industry. Meantime, the debate as to the true reality of the disorder carries on as scientific evidence continues to accumulate in favor of the physiological aspect of fibromyalgia. Currently, traditional and complementary medicine success rates in treating the disorder points to the fact that it is primarily a physiological condition with biological origins. Fig. 1: American College of Rheumatology’s tender point list for classifying fibromyalgia. Clients are required to have pain in 11 or more of the 18 sites to be considered a true fibromyalgia case. In the face of the debate as to the origin of disorder, the American College of Rheumatology comprised a list of criteria for the purpose of classifying fibromyalgia. The list includes classic symptoms such as having a history of widespread pain for more than three previous months. The college went on to define a series of 18 checkpoints (tender points) for the pain sites. (See Figure 1). A client is required to have pain in 11 or more of the 18 sites to be considered a true case of fibromyalgia.2 Since the symptoms are relatively simple to recognize, why the continued debate? Part of the trouble lies in the fact that the symptoms are sometimes vague and reminiscent of other musculoskeletal complaints. From the massage therapist’s office to the traditional medical facility, clients/patients are presenting in increasing numbers with a variety of unexplained symptoms. However, there are definitely some shared symptom commonalities such as predictable tender points, extreme fatigue, poor sleeping patterns, and whole-body pain upon awakening. Regrettably, musculoskeletal pain research generally lags behind wellfunded scientific projects with possibilities for more lucrative outcomes. It often takes years to definitively confirm and classify conditions with vague, widespread symptoms like fibromyalgia. This confusing disorder continues to be poorly understood, and clients often suffer for several years before a medical diagnosis is made. Figure 2 illustrates an interesting biological explanation detailing the downward degenerative spiral seen in many fibromyalgia clients. Fibromyalgic symptoms have been described as steady, radiating, burning, and spreading over large areas of the body. The pain often involves the neck, shoulders, back, and pelvic girdle. Clients report that pain seems to emanate specifically from muscles, tendons, ligaments, bursa, and joints. Most identify pain as their cardinal symptom. Fibromyalgia pain appears to worsen with cold temperatures, increased humidity, weather changes, overexertion, and stress. Many clients report symptomatic pain reduction with hot baths, heating pads, and warm weather. Fig 2: Biological cellular breakdown diagram details the downward degenerative spiral seen in many fibromyalgia clients. Irritable bowel syndrome (IBS) is another commonality that fibromyalgia clients tend to share. It is interesting that IBS is an accepted medical disease even though there is no concrete medical proof of its origin or existence. Yet IBS is widely accepted by the field of medicine while fibromyalgia is still under scrutiny. The reduced ability to concentrate as well as frequent bouts of depression also tops the fibromyalgia symptom list. Careful examination reveals areas of pain on palpation but without the classic inflammatory signs of redness, swelling, and heat in the joints and soft tissues. Skill in palpating tender points is critical to establishing a correct assessment for fibromyalgia. Physical findings encountered during soft-tissue palpation include tender points, increased resting muscle tension, and tissue texture changes in the skin and subcutaneous fascia. When assessing the possibilities of fibromyalgia, it is important that other potential conditions be ruled out as well. The symptoms may mimic dysfunctions such as myofascial pain syndrome, peripheral neurogenic pain, medicinal toxicity, and some types of arthritis. Therefore, when presented with the possibility of a true fibromyalgia case, detailed assessment and history intake are of utmost importance. Since the most significant area of pain tends to shift over time, the first step in assessing true fibromyalgia is to determine if similar functional/structural disorders are at play. Myofascial pain syndrome (MPS) emanating from hyperirritable trigger points is often confused with fibromyalgia. To complicate the situation, MPS may occur in clients suffering with fibromyalgia. However, a carefully conducted history intake and physical examination usually helps the therapist determine if the client is presenting with fibromyalgic symptoms, MPS, or both. While fibromyalgia pain is widespread with changing areas of emphasis, myofascial tender points are typically restricted to one spot, though the point may refer pain to other areas. Fig, 3: Therapist palpitates suboccipital tenders points with client sitting and standing to determine if pain is reduced while sitting. Pain reduction in seated position indicates possible pelvic imbalances initiating the myofacial/neurologic pain syndrome. Fibromyalgia tender points should remain unchanged in both the standing and sitting positions. Contrary to popular belief, many in the medical field do not believe MPS symptoms arise from taught myofascial trigger point bands, but instead from peripheral nerve pain at motor end plates.4 Much of the neurological literature today does not include the trigger point taut band theory as a recognized anatomical cause of entrapment neuropathy. Since the connective tissues of human peripheral nerves are well-innervated, some researchers believe peripheral nerve pain (aching, tingling, and numbing) best describes the symptoms occurring in many myofascial pain syndrome cases. MPS is said to result from hyperexcited chemoreceptors activated by inflamed, disorganized nerve ending bundles. Regardless of the outcome of the myofascial pain syndrome debate, the disorder still should be easy to identify during the evaluation process since the client’s pain will be limited to a particular region (over time), often eliciting a referral pattern when digital pressure is applied. Although location does little to distinguish between MPS and fibromyalgic tender points (since they often occur in similar body areas), specific hands-on assessments help to clearly differentiate between myofascial pain and fibromyalgia (see Figure 3). As is the case with many disorders, fibromyalgia is attracted to one gender more than another. This agonizing condition is more pervasive in women with the most common onset between 25 and 50 years of age. Estimates of prevalence are 3.4 percent for women and 0.5 percent for men.5 It is estimated that 20 percent of the female population will end up in a rheumatologists’ office. Women suffering fibromyalgia often report high levels of stress in their daily lives, which also contributes to the idea that it may have roots as a mental health disorder and not completely physiological in nature. Because the brain’s emotional center (limbic system) is the highest cortical level regulating muscle tone, any alteration in limbic function may precipitate myofascial pain patterns. Psychologic disorders have been, and continue to be, researched to determine if a relationship exists with fibromyalgia. The disorders of depression, somatization, panic, and obsessive-compulsive behavior have been seen in some fibromyalgia clients. Depression occurs in about 20 percent of clients and may be the result of having to live with chronic pain. The debate is based on the belief that some think fibromyalgia is actually a mental health issue. There are those who believe it to be a subconscious attempt to avoid the stresses of daily life and work. Currently there is not a known physiological explanation for the widespread array of symptoms common to all sufferers of the disorder. Fig. 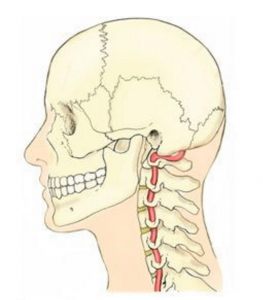 4: The vertebral artery is vulnerable during head on neck extension and rotational movements as it is compressed against the posterior arch of the atlas. Poor occipitoatlantal and atlsntoaxial alignment from forward head postures and stomach sleeping coprimises blood flow to posterior and mid-cranial regions. It is because of the lack of a generally accepted physiologically-based explanation that it is often suggested to be a mental rather than a physical disorder. Fibromyalgic symptoms could also be caused by mental malfunctioning according to those who do not believe it has a physiological basis. Over half of those diagnosed with the condition have a past history of other ailments, which also have no medical proof of existence including chronic fatigue syndrome, irritable bowel syndrome, and chronic headaches.6 It is this dilemma that causes some experts to reject a medical origin and point to mental health networks for answers to the problem. The confusion with the mental health suggestion is that it does not explain certain physical changes that take place in patients with fibromyalgia. Certain organic aberrations have been found in people with fibromyalgia, although it is not yet known whether these came before or after the syndrome developed. Among them are changes in nervous system chemicals that may explain the common problem of disturbed sleep. Fibromyalgia patients typically lack restorative or slow-wave (theta and delta sleep, which can result in chronic fatigue and heightened sensitivity. Researchers have found levels of substance P, a chemical related to pain, and some abnormal painrelated peptides to be excessively high in the cerebrospinal fluid of fibromyalgia patients.7 Heightened levels usually mean the person perceives more pain. In a study reported in the Journal of Rheumatology, Muhammad Yunus, M.D., and associates, discovered that people with fibromyalgia actually had diminished blood flow — meaning less functional activity in two areas of the brain that help regulate the amount of pain signals the brain receives.8 This study supports the author’s belief that poor upper cervical alignment from forward head postures may be a contributing structural factor to fibromyalgia. Poor occipitoatlantal (O-A) and atlantoaxial (A-A) alignment can compromise (occlude) vertebral and basilar artery output to posterior and mid-cranial regions, robbing the brain of vital nutrients, especially oxygen (see Figure 4). Massage and other bodywork therapists should be cautious when assessing, speculating and particularly labeling perceived causes contributing to a client’s neck and back pain — i.e., work-related accidents, specific diseases or overuse syndromes (fibromyalgia, degenerative disc disease, sciatica, etc.). A good history with helpful notes can be recorded without verbally labeling our individual thoughts about the client’s condition. Very few states grant massage therapists the legal authority to label (i.e., diagnosis). And for good reason — most lack the diagnostic ability or testing equipment to properly label a client’s acute or chronic condition beyond dispute. In addition, verbally attributing musculoskeletal pain conditions to specific causes can create inappropriate fears, anxieties, or avoidant behavior in clients. Noted pain specialist Dennis Turk, Ph.D., believes that “since fear is a natural consequence of pain, pain-related anxiety and fear may actually accentuate the pain experience in many chronic pain cases.”1 If clients with pain are exposed to fearful situations, they typically respond with either unnecessary worry or escapist behavior to avoid any anticipated harm. Avoidant behavior can sometimes be useful in the context of acute pain but loses beneficial quality in clients suffering chronic pain disorders such as fibromyalgia. Reliance on the acute model of pain in cases of chronic pain is often inappropriate. For example, leading the client to believe that activity might aggravate the disorder and cause more harm can result in fear of engaging in rehabilitative efforts.This can lead to obsessive mental preoccupation with bodily symptoms and physical deconditioning that only exacerbate the pain, thus causing the client to maintain the disability. Fig. 5: Tender point therapy must be accompanies by postural corrections using Vladimir Janda’s unique muscle-balancing formula. Following postural evaluation, specific deep tissue, assisted stretching and myoskeletal routines help restore symmetry, strength and pain-free range of motion. While it is tempting for the client to relax and not move joints and muscles that are hurting, moving them is one of the best preventive and curative measures found so far to alleviate the painful symptoms. Traditional massage techniques are helpful in desensitizing hyperexcited cutaneous (skin and fascial) neuroreceptors. However, deep-tissue techniques that incorporate active client movements (enhancers) during the hands-on work add additional therapeutic power by calming pain generating articular (joint) receptors. 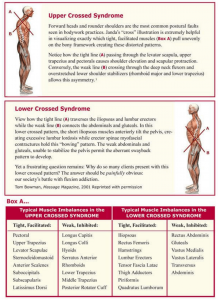 Intrinsic muscles and joints are inseparable; what affects one always affects the other. Therefore, a more holistic approach to treating fibromyalgia and myofascial pain syndromes should include soft-tissue techniques that create extensibility in contractured tissues; tonify weak muscles; and decompress impacted, motion-restricted joints and their supporting ligaments. Incrementally, the more exercise clients are able to do, the better they will feel. It doesn’t matter what kind of aerobic exercise — swimming, biking, jogging, walking, dancing — as long as they hit their target heart rate for at least 30 minutes a day. Some clients report feeling better as they gradually increase their exercise programs to 30 minutes twice a day. Why do clients suffering fibromyalgia improve with vigorous exercise? One notion suggested is that aerobic exercise beefs up the body’s supply of endorphins, a natural pain-dampening and sleep-deepening substance. Exercise increases levels of serotonin and growth hormones, the exact pain-reducing, muscle-repair hormones that people with fibromyalgia may lack. Exercise also increases blood flow to the muscles. It is well-documented that people with fibromyalgia do have slightly less blood flow to their muscles, which might also contribute to pain. Exercise and bodywork together are often just the answer for helping reverse this often debilitating condition. *** Fibromyalgia is a disorder with no widely accepted medical proof. It is a chronic condition characterized by symptoms of widespread pain and tender points as well as fatigue, depression, and sleep disorders. 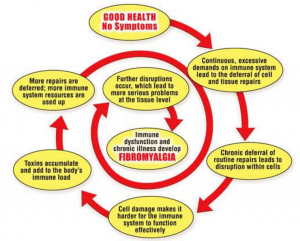 While scientists at the present time have found no generally accepted way to medically document the existence of fibromyalgia, it has been proven that there are physiological changes present in many who have the disorder. The debate will continue to rage as to its origin and existence. Some insist that it is a medical condition while others are convinced that it is a mental health issue. Meantime, as the research rolls in and the truth is eventually decided, it is in the client’s best interest to immediately begin routinely scheduled bodywork sessions in conjunction with a specialized exercise regime regardless of origin. Well structured manual therapy sessions and individualized rehabilitation programs appear to be the treatment of choice for this chronic and sometimes disabling condition that affects an estimated 2 million Americans each year. Quinter, J., Cohen, M. Fibromyalgia falls foul of a fallacy. Lancet 1999; 353:1092–1094. Sinclair, J.D., Turk, D.C., Okifuji,A., et al. Interdisciplinary treatment for fibromyalgia: treatment outcome and 6 month follow-up. Arthritis Rheumatism 1996;39(9):S91. Sprott, H., Franke, S., Kluge, H., et al. Pain treatment of fibromyalgia by acupuncture. Arthritis Rheumatism 1996;39(9):S91. Devor, M., Rappaport, Z.H. Pain and pathophysiology of damaged nerve. In Fields, H.L., ed. Pain Syndromes in Neurology. Oxford: Butterworth Heinemann; 1990:47–83. Goldenberg, D.L. Fibromyalgia syndrome a decade later: what have we learned? Archives of Internal Medicine 1999; 159:777–85. Perlmutter, Cathy. The truth about fibromyalgia. 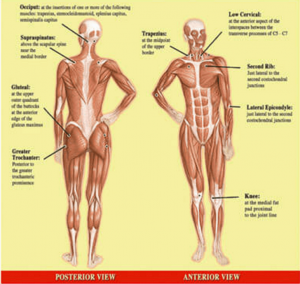 Musculoskeletal disorder. Prevention 1997 April 1;Vol. 49 (86):8. Wilke, W. Treatment of resistant fibromyalgia. Rheumatic Disease Clinic of North America 1995 Feb 21;21(1),247–60. Yunus, Muhammad B. Towards a model of pathophysiology of fibromyalgia.Aberrant central pain mechanisms with peripheral modulation. The Journal of Rheumatology. 1992 31:2464–7.